There are floods all around. The TV won’t mention climate change. Here is one thing you can do. We are visiting family living in the country just outside St. Louis, Missouri, in the US. Eureka, the small town at the bottom of our hill, is under water. Pacific, five miles away to the west, is under water. Valley Park, five miles to the east, is under water. Twenty four miles of Interstate 44 are closed. The flood levels are the highest ever recorded. There is flooding all over the St. Louis area. This is happening at the end of the hottest year on record. It is happening after a week of unprecedented weird weather in North America. There has been constant coverage of all this on local news channels. Our town is on national TV. They keep saying this is historic. No one says the words “climate change”. 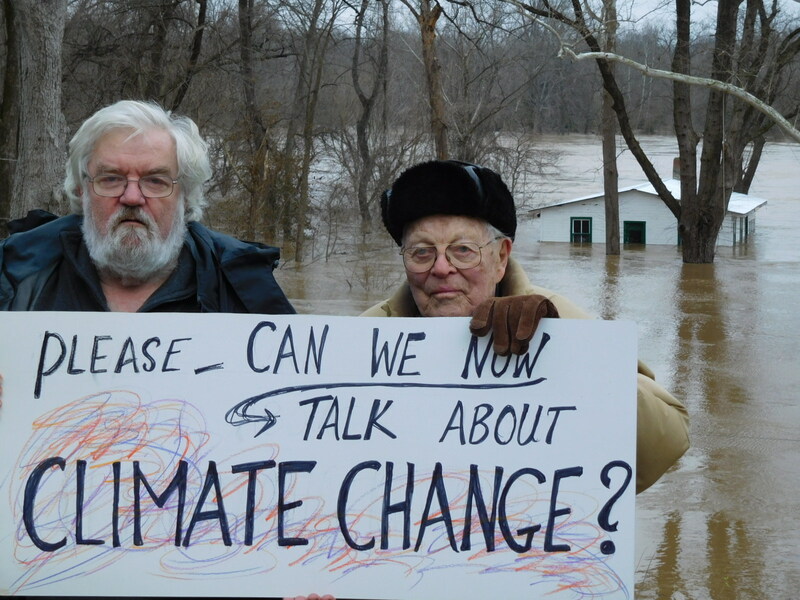 So Nancy, Jim and I decide to do our own demo, in front of the flood, with a home made sign saying “Please can we now talk about climate change”. You can do this too, if you have a flood. Or a tornado, or an unprecedented blizzard. If you have a friend, you can do it together, and one of you takes the picture. Then share it on social media. Change the conversation. Embarrass the TV stations. Sometimes, but rarely, the TV mentions El Nino. After all, they have to have some explanation. What they don’t explain is why this El Nino is so much hotter than all the previous El Ninos were. El Nino in the Pacific Ocean off South America alternates every few years with La Nina in the Pacific Ocean off Southeast Asia. In the last few years, the world has been growing warmer, but this has been masked in North America by the effects of La Nina. Now we are back to El Nino, and the mask is off. You can argue about this. But the point is: the television won’t say the words “climate change”.